This past week I’ve worked on 4 different quilts. 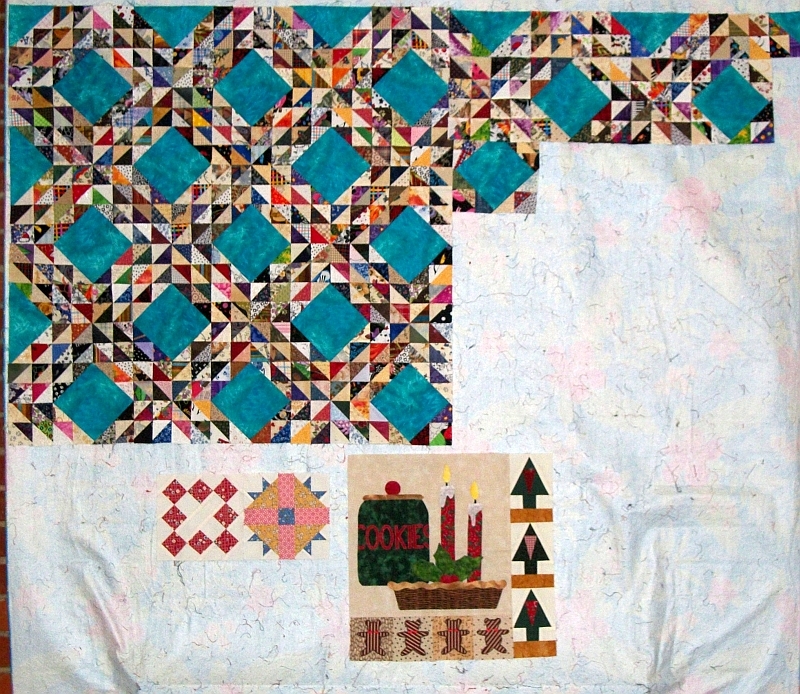 The Double Wedding Ring — my progress is shown in the drawing on the right side bar — if it’s colored in I’ve quilted that section. My Christmas BOM — I made the Cookie Jar block and attached the sections next to it. Sylvia’s Bridal Sampler — made two blocks — Album 2 and Crown and Cross. I see now the yellow blends into the pink, but I’m not doing it over. Finally I pieced a bit of Ocean Waves. The cool thing is at the end of the first week I have my January UFO challenge done. On a different note, I looked down Saturday afternoon and realized I had two pairs of snips on my desk. I’ve been missing one pair for quite sometime. Saturday morning I pulled the DWR out of the laundry basket to mark the quilting on the current row. I noticed the snips in the bottom of the basket and brought them into the sewing room/office. Apparently I lost them in the quilt. Now if I can just find the second cover…. Don’t forget to check out the links over at Patchwork Times for some great quilting inspiration. Every time I see an Ocean Waves it makes me say Wow. And yours is no exception. I love the colors you are using. Great job on it and your other projects too. I seem to like the Ocean Waves quilt in whatever colors I see it done in-must mean that it is one to go on my to do list. Yours is beautiful.